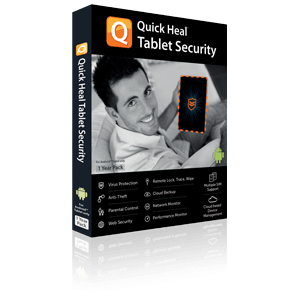 Secures the file system of your tablet from malicious threats. Protection remains active in the operating memory of the device and scans all files that are open or saved including those on the memory card. Blocks access to fraudulent websites that might phish your valuable information.? Helps detect and quarantine any malicious object on your device. A regular scan keeps your device safe from unseen threats. Helps to track, lock and wipe the personal data in case of loss or theft using pre-defined SMS or remotely. You can also wipe selected data remotely by sending a predefined SMS. Take a backup of your personal information such as contact numbers, text messages, calendar events, and pictures with Quick Heal Remote Device Management (RDM) and retrieve it whenever required. Takes automatic virus database updates so that your device remains secure from real-time threats. Enables you to block unwanted calls by creating a ‘Blacklist’ of numbers.? Enables you to silently block unwanted and spam SMSs such as news, advertisements, marketing messages, and even offensive texts. Allows you to check the functioning of tablet, control power saver, speed up device performance, and view the performance reports. Provides information on detected threats, updates, and extensive reports. Add multiple SIM numbers to Trusted SIMs List. This feature is beneficial for users using multiple SIMs. When SIM is changed, the device is not blocked. Fifty (50) SIM numbers can be added to Trusted SIMs List.